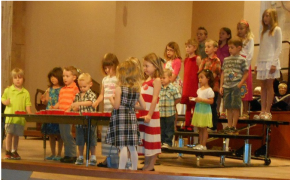 North Scottsdale UMC offers three children's choirs. The Cherub choir is for our tiniest children (ages 2-5). 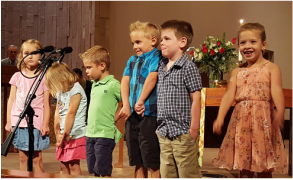 The Kids of Grace choir is for our children in grades 1st through 5th. We also offer the AngeliX choir to students in grades 6th through 12th. All choirs practice during the Sunday School time (during our second service at 10:00 a.m.). Each choir will sing one Sunday per month during a designated service. Watch our bulletin for the scheduled performances. The Cherub choir (ages 2-5) practice during the 10:00 am Sunday School in their classrooms. They perform monthly during the 10:00 am worship service. The Kids of Grace choir (grades 1st - 5th) practice during the 10:00 am Sunday School in their classrooms. They perform monthly during the 10:00 am worship service. 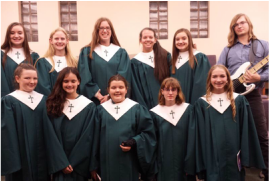 The AngeliX choir (middle school and high school students) practice at 9:30 am on Sunday morning prior to their Youth Sunday School time at 10:00 am. They perform monthly during the 10:00 am worship service.